A better brain model for better brain research. When it comes to building model organs, perhaps none requires as much precision and exactness in detail as the human brain. 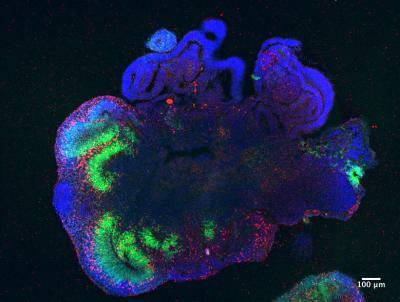 In an effort to improve upon existing models, scientists at the Salk Institute studied a 3D “mini-brain” model grown from human stem cells. They concluded that it was more similar to human brains, both structurally and functionally, than the 2D models currently in use. However, until Ecker and his colleagues conducted their recent study, published in the December 20 issue of Cell Reports, no one knew just how accurately these COs mimicked real brains. To figure out just how realistic these 3D brains were, Ecker’s team studied COs in early stages of brain development and compared them to actual human brains in similar developmental stages. The COs Ecker and his team used were from a human embryonic cell line called H9. With the right chemicals, H9 was induced down a neurodevelopmental pathway for 60 days. They studied the COs epigenomes — basically, the chemical compounds that tell a genome what to do — because these have been increasingly associated with the development of brain diseases such as schizophrenia. After comparing their results with age-matched real tissues from the National Institutes of Health NeuroBioBank and with 2D brain-model data from other researchers, they saw that COs were more like authentic brains than their 2D counterparts and seemed to grow following the same early-developmental timelines as real brains. With a model that’s closer to a real brain, scientists will be better equipped to study brain development and its role in the emergence of neurological diseases such as Alzheimer’s or schizophrenia, putting us one step closer to improved treatment options or even cures.